1. Trasko in Brief: The Trasko Refining Unit came about when the Govt. officials of the Tokyo metropolis started exploring the possibilities of improving the maintenance of their vehicles for increasing their longevity and reducing environmental impacts. In 1985 the Trasko-Bee Corporation in a joint venture with the Subaru Motor Corporation in Japan introduced this refining unit and won an award from the Mayor of Tokyo. The manufacturing premises were expanded to establish The Trasko-Korea Co. Ltd. August 1998, LOFMR introduces the Trasko Ultra-Fine Unit for the first time and makes it available both for fleet and individual use. 2. 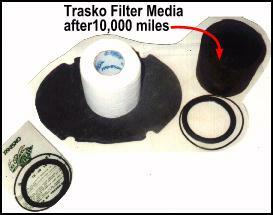 How is the Trasko Oil Filter different from any other systems? The Trasko unit consists of a reusable canister with built-in 36 cooling fins. Trasko traps particles by lateral dispersion. The special filter element composed of kiln-dried paper has a fine porosity that traps fine particles from flowing oil while dispersing through its permeable layers. The special pressure relief valve-nut actuates when there is a pressure build-up or a surge. The valve then redirects or bypasses the oil to circulate through the 8-10 micron mesh (The critical pressure for setting itself into a bypass mode is between 65-70 psi). Thus regulating a constant pressure differential in the range of an Input/Output of 1.00 : 0.89. When flow is least restrictive the absolute particle rating efficiency is less than a micron. Upon relief actuation the secondary efficiency is still between 8-10 microns. An efficiency rating still higher than any stock type full-flow filters. The Trasko is a hybrid filter, conditionally set as full-flow oil system for any engine and changes itself into the bypass mode when it experiences a pressure above its critical range. Regular shunt market filters are designed full flow only and if they do have a bypass valve then their bypass is without a guard and the oil flows without any filtration. The Trasko can be used also as a bypass unit, if you prefer to install it along with a regular filter on a dual remote mount. The Trasko is a highly recommended product for diesel applications as well. 3. Does the Trasko need extra headroom for installation? NO. All the cross-references are according to the actual sizes of the filters in the table. In some cases extra 0.5 inch clearance on the outer diameter may be required for the built in cooling fins. Please check the space available in your vehicle and the space required by each specific oil filter before you place an order. You will have to use the Relocation Kits only if you do not have the required space, or you want to add to your convenience. Please check under the cross-reference table under each filter column labeled Dimensions for headroom space. 4. Could you use the regular tissue paper as a filter element available in grocery stores? NO!!! Trasko’s patented tissue rolls are composed of different porosity and permeability. The filter media comes in three different sizes for the 20S, lOS and the lOSS series. NO other media is recommended as a substitute. When ordering replacement kits be sure to mention the size of the unit that you have installed to your engine. Find out which filter fits your vehicle by referring to a Fram filter guide (available in Wal-Mart Stores). You may also try this FRAM, Look-up Utility. Then utilize our Cross-reference Guide to match the specific size. 5. Does the tissue roll media flake-off when the unit is in operation? 6. When do you change the media roll and gaskets? Media, gaskets and Oil change is recommended at first 5000 miles then every 10,000 miles the change is only mileage related. For example, if you drove only 15,000 miles in a year you would have to change it only 2 times while still maintaining the oil level. 7. Does Trasko need extra headroom for installation? NO. All the cross-references are according to the actual sizes of the filters in the table. You could use the Filter Relocation Kits to add to your convenience, but it is not necessary for installing a Trasko Unit.